(Last Updated : 03.04.19). 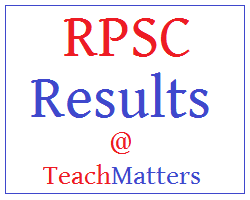 Rajasthan Public Service Commission (RPSC) declared Reshuffled Result of Sr. Teacher 2nd Grade Comp. Exam-2013 in compliance of Honorable Supreme Court of India. The Result against Rejected Candidates for Sr. Teacher Grade-II (Sec. Edu.) Comp. Exam-2013 for the subjects of Hindi, Maths, English, Science, Sanskrit, Social Science & Urdu was declared in the month of February, 2016. Reserve List and Reshuffled Result with Cut-off Marks for Sr. Teacher Grade-II (Sec. Edu.) Comp. Exam-2013 for the subject of Science, Maths, English, Hindi, Sanskrit & Social Science was earlier uploaded by the commission. You can download/see result here. RPSC released a Press-Note dated 15.04.2015 regarding Subject Wise List of Missing Detail Forms of Candidates for Sr. Teacher Grade-II (Sec. Edu.) Comp. Exam-2013. RPSC has revised the Result of Sr. Teacher Grade-II Comp Exam 2013 of Maths Teacher, Science Teacher Urdu Teacher, Social Science Teacher, English Teacher, Hindi Teacher & Sanskrit Teacher. Earlier, RPSC had declared result of Sr. Teacher Grade-II Comp Exam 2013 (Secondary Education) on 17.09.2014 and invited online/offline options regarding this result from the candidates of TSP Area. The commission has revised the result of the above said exam after the receiving of online/offline options from the candidates.